The New York Bank Hoard. This gorgeous antique finish silver coin represents one of three Coin Invest Trust (CIT) 2017 skull designs produced for issue by the Republic of Palau. Struck from 1 Troy oz. 999 fine silver, measuring 38 mm x 29 mm, this skull shaped coin features the characteristics of a pirate, minted in incredible high relief with CIT's smartminting&###xA9; technology. Mintage is limited to 1,750 coins. The reverse is a front-facing skull, featuring three-dimensional high relief details enhanced with a dramatic antique finish, which draws attention to the eye and nose cavities as well as the Pirate-like attributes of chipped and missing teeth, bandanna and hoop earrings. 999" above and "2017 below. Flawless Mint State 70 with Exclusive Pacific Rim Label. 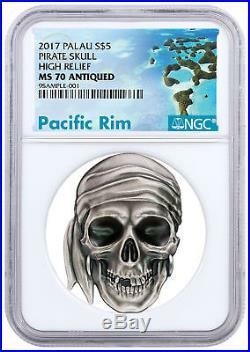 Numismatic Guaranty Corporation (NGC) reviewed this 2017 Palau Pirate Skull 1 oz. Silver coin and determined it to be in perfect Mint State 70 condition. The flawless antique-finish shaped coin is sealed in an NGC protective holder accompanied by ModernCoinMart's exclusive Pacific Rim-themed certification label. 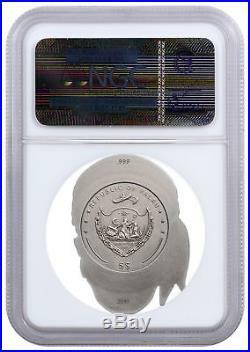 Don't miss your chance to add this low mintage, perfectly graded, 1 oz. Antiqued Silver High Relief Pirate Skull shaped coin to your collection! &###xA0; &###xA0; &###xA0; &###xA0; &###xA0; &###xA0; &###xA0; &###xA0; &###xA0; &##xA0. We cannot make any price adjustments after the sale is complete. Product Photo Policy: MCM attempts to display product images shown on the site as accurately as possible. We take all of our photos in house and due to reflections on the mirrored or proof surfaces of a coin there may appear to be'black' when there is not. If a coin has a color on it at all it will be described as'colorized' in the description or title. Due to the large inventory we sell, we use stock photos. Serial numbers will vary from the image shown unless specifically stated in the product listing that the item pictured is the item you will receive. INTERNATIONAL ORDERS POLICY: We are accepting international orders from select countries.